Nonprofits are dependent on their ability to connect with donors, volunteers, and advocates—and drive them to action. Without this generous audience, most nonprofits simply couldn’t exist. And yet it’s well known that nonprofits are often strapped for time, budget, and resources—so reaching supporters in a cost-effective way can be challenging. Today, many innovative and successful nonprofit organizations are turning to one solution to help with this task: email marketing. Email is truly a perfect fit for all of a nonprofit’s communication needs; it is a cost effective channel that’s easy to use, it can reach a vast audience quickly, and it’s proven to drive results. Whether it’s being used to raise funds for a worthy cause, drive attendance at an upcoming rally, or otherwise mobilize supporters, email is a critical channel for nonprofits. In fact, a recent study of nonprofit marketing found that email raises an average of $36 for every 1,000 messages sent, and accounts for 26 percent of online revenue. 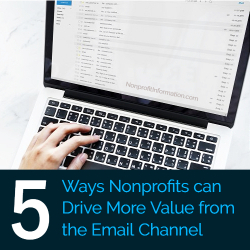 With numbers like those, it’s important for nonprofits to take full advantage of the email channel. And that means really digging into how email works, to understand the various factors that can influence the success of an email campaign. Following are five areas to consider as you build—or improve—your nonprofit’s email program. Email provides a great opportunity to appeal to advocates and raise much-needed funds. But in order to be successful, your email campaigns first need to land in the inbox. Not every email reaches its intended destination. Some are “bounced” due to bad email addresses and other factors. Others get caught in spam filters before they are delivered. Only those messages that actually land in the inbox have the potential to mobilize your audience, so maximizing inbox placement is critical. As of 2017, the average inbox placement rate for nonprofits is 76 percent—which means that one out of every four messages cannot fulfill its intended purpose. Inbox placement is influenced by many factors—including sender reputation, list quality, and subscriber engagement—so there’s plenty that a nonprofit marketer can do to improve this critical metric. As a nonprofit marketer, your main goal is to get supporters to take action. However, the mailbox providers that decide whether your email reaches the inbox (like Gmail, Yahoo, and AOL) have a very different agenda. Their primary objective is to provide the best possible inbox experience for their customers—email recipients. And that means delivering only the messages that consumers really want, and sending any unwanted mail to the spam folder. Sender reputation is a significant factor in these filtering decisions. Much like a credit score helps a bank to determine a borrower’s creditworthiness, sender reputation provides a way for mailbox providers to distinguish between legitimate senders and spammers. Many factors contribute to your sender reputation, including spam complaints, sending practices, and list quality. A good reputation increases the chances that your email will be delivered to the inbox, while a poor reputation will land your messages in the spam folder. Return Path offers a free tool for calculating your sender reputation, called Sender Score. Our research shows that nonprofit companies have relatively few reputation issues, but it’s always a good idea to monitor your sender reputation to prevent possible inbox placement concerns. Having a “clean” subscriber list is important for any email marketer, but it’s especially challenging for those in the nonprofit sector. Because nonprofits aren’t selling anything or offering subscribers any direct benefits (like sales or discounts), they often struggle to grow and maintain a high-quality list. Some nonprofits resort to renting or purchasing a list, but this is generally not advisable. Although they can provide quick and easy access to a large number of subscribers, rented or purchased lists can be littered with spam traps, unknown users, and other undesirables. Sending to these bad addresses will damage your sender reputation and limit your ability to reach the inbox. The best way to acquire new subscribers is to do so organically. Of course, building your list is only half the battle. It’s also critical to monitor your list and take action to ensure that it remains as clean as possible. This includes keeping an eye out for inactive subscribers, removing any address that produces a hard bounce, and taking advantage of the feedback loops that are offered by many mailbox providers. Every nonprofit marketer knows the importance of loyal, engaged donors and volunteers. But engaged email subscribers serve another purpose, beyond ensuring that worthy causes are supported. They can also help to make sure your email messages reach their intended target. As part of their ongoing efforts to combat spam and other threats, mailbox providers like Microsoft, Google, Yahoo, and AOL have begun using “engagement metrics” to understand what content their users truly value. These metrics go beyond sender reputation to look at how users interact with messages from a given sender—things like how many messages are read, replied to, forwarded, and deleted without reading. Whitelists are the “secret weapon” of many successful nonprofit marketers. A whitelist is a record of senders who meet established standards for reputation, engagement, and sending practices, thus proving themselves to be legitimate and responsible. Email from whitelisted senders receives special treatment, including reduced filtering, resulting in higher inbox placement rates. Individual mailbox providers offer whitelisting services, but these benefits are limited to email sent to their own users. Since most nonprofits have subscribers at a variety of email clients, most opt for a more universal whitelist that provides preferred handling with multiple mailbox providers. With more than 15 years of marketing and PR experience, Jen Ribble is passionate about the art of storytelling and the science of creating high quality, data driven content. In her current role as Director of Public Relations for Return Path, the world’s leading expert in email deliverability, Jen is responsible for elevating the company’s reputation in the marketplace, crafting engaging thought leadership content, enhancing customer relationships, and driving inbound leads. In her spare time, Jen is an aspiring chef and food lover, a movie fan, and a travel junkie.